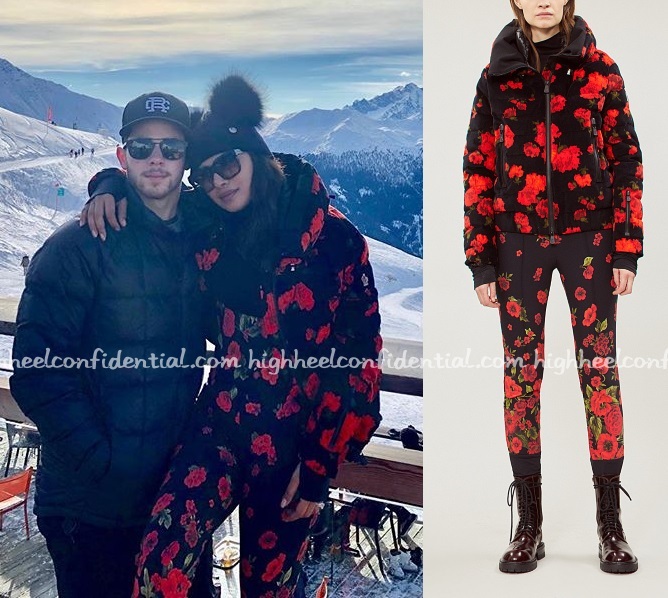 Priyanka and Nick are spending time in Switzerland skiing with family and friends this week and while skiing, she was spotted wearing a rose-print Moncler jacket and pants and a faux fur Apparis coat. But the bottom pic with the tongue stuck out is just eeks ! Even Priyanka looks uncomfortable in the bottom pic. its the typical bollywoood movie style look…done in so many movie she has it down pat. I don’t like the rose print outfit but the faux fur Apparis coat is cute and so is the hat with the two pom-poms. Top and bottom floral is ott but white jacket is cute. Looks damn silly. Bohot jyada hogaya. White jacket is nice. The floral outfit looks very curated and ott..
On an aside, was she ‘spotted’ or are such pics shared by celebs themselves? I really wonder why they do not wish to keep some moments of their life to themselves?